It is the strangest thing to watch land creep forward. A ‘spit’ of shingle – a long leg of land stretching out to sea in the National-Trust owned Blakeney National Nature Reserve – is almost separated by the sea, yet moves inexorably towards the mainland. For three little ports governed by the River Glaven, creeping land can have life-changing consequences. Three thriving 16th century ports lost their livelihoods; and the villages have flooded as a result of someone taking land which was once the sea’s. On Blakeney salt marshes there are the remains of an old house. Now it has all but disappeared. They call it Blakeney Chapel, though no mass was ever said there. It is built on an eye in the marsh: a small patch of higher land, out there amongst the bleak mudflats. Folks lived there from the 14th To the 16th Centuries, and again at some point in the 17th. Archaeologists found much of the pottery inside was imported from the continent, and its owner might have been a trader with the countries beyond the sea. Standing 2m above sea level, on a sandy mound in the marshes, it consists of two main rooms and a hearth which was used for iron smelting. Archaeologists say it was of sturdy and costly construction, though villagers have carried the remains off long since, for use in the houses further inland. In 1640, just west of Cley-Next-The-Sea, some bright spark began reclaiming land. It changed everything, and what had been three busy ports began to silt up, and a spit of land to form off the coast. Two hundred years ago,locals started measuring the distance between the old chapel and the sea. Just how fast was the land moving? In 1817 it was 400m away. By 1835 that was 320m; in 1907, 275m and by the end of the 20th century, 195m. The spit of land is a dynamic, moving being, moving towards the mainland at 1m a year. Change is a natural process, but how swift it comes in this wildest of places. And it is moving towards the chapel. The Environment Agency realigned the Glaven River south of its original line; the ruins of the chapel are now north of the river embankment. As the spit continues to move south, Blakeney Chapel will be buried as the ruins of a priory out on the marshes were, before it. But communities live and thrive there, nonetheless. Not least the 500 seals I watched today from the prow of a boat. 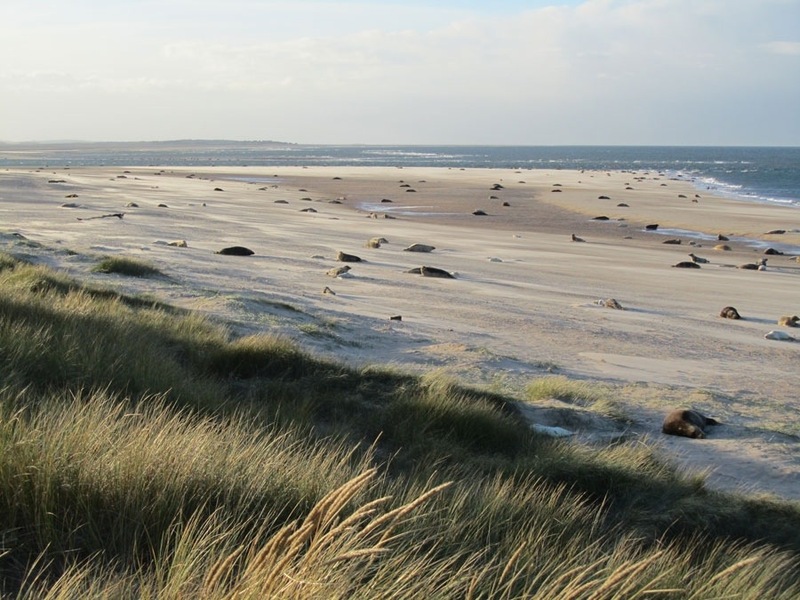 They are untroubled, thriving and basking out on the sandbanks at Blakeney Point. Here on the edge of the North Sea, the land where once the Vikings ruled, the wisest creatures learn to seize the day. Tomorrow, who knows what will have changed? Posted in UncategorizedTagged england, Norfolk, travelBookmark the permalink. Great post! Lovely photo, too. I don’t know this part of Britain very well so this was an interesting read. Hello, Jo! It is well worth a visit. And it majors in the strange. wonderful. I spent time at the coast with a geographer dl9ng her thesis on the ‘movement’along our east coast. nothing out there till antarctica or australia so the sea can move the land along. I envy you, Sidey. What an amazing experience that must have been. Nature at work. Endlessly fascinating. Sounds like you’re enjoying where land and sky greet the sea. Nancy, it is entrancing. everything I thought it would be and much more. You would have loved the seals. Do you have them there? Our part of the world is constantly being re-shaped with beach erosion, sand bagging and sand nourishment. Every time it rains hard, Charleston becomes Venice. An interesting time we live in with polar ice melting and seas rising, thinking about growing some webbed feet. The more I hear about Charleston, Lou, the more I yearn to visit. I love that part of England. How the cathedrals are all built on hight points of land that were once islands. I always try to imagine that when I’m there. ha! I must see Charleston. Packed with stories, it is. I have only been to that area one time. Don’t I recall windmills there? Seems like a lovely getaway for you. Tammy, you would love it. Since California is nothing but shifting land, I’m rather accustomed to land movement. But this “creeping land” is mysterious. The photo with the seals is just wonderful! You’re right–they don’t look too concerned. There’s a wonderful life lesson in that, isn’t there! I’d love to see it. Thanks for sharing, Kate. It’s quite fascinating. It is a must-see if you’re ever here, Cindy. ‘Arrr, and the spit she be comin’ to get ye!’ Something scary about that. I can’t help comparing the spit found off Leisure Isle at Knysna Heads, which has remained pretty stable for the whole of my lifetime despite ‘progress’ with rivers being blocked or diverted and filling-in taking place. A very resilient spit indeed, Col.